“Third snake over here,” I narrated to the camera. “Fourth snake over there.” We were surrounded. Our enchanted little island was becoming less so by the minute. “No wonder this place is uninhabited,” remarked April. We found ourselves standing back to back in a defensive position. The snake in my viewfinder had turned away from the water and was now gliding up the shingle towards us. “Watch to your left!” April warned. 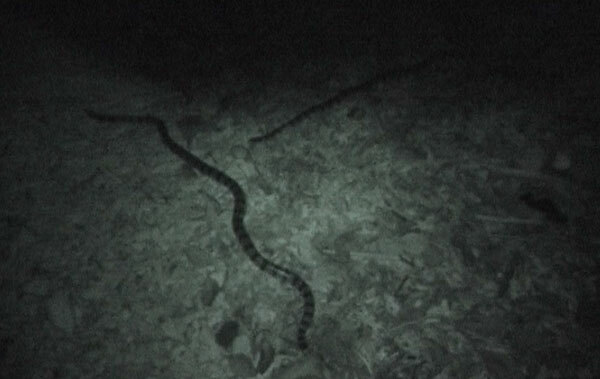 I switched the camera to night vision mode to better track the snakes in the darkness. “Just keep an eye on that one,” said April, pointing to a length of black hosepipe slithering off the edge of my screen. It was a nightmare. The prospect of trying to extract lethal snakes from our cockpits made my head reel. The two heading for the boat altered course and made straight for us, crossing and re-crossing each other’s paths, heads raised, weaving back and forth. April and I began inching down to the water’s edge to make a last stand. With our backs to the sea, we had less area to defend. This was assuming the snakes didn’t take to the water, quite possible considering they were amphibious. “Okay, here comes one,” said April, pointing to the nearest, now a few feet away. As a vegetarian of nine years, my rule of thumb was not to kill or eat anything that shat or had a face—both indicators of higher intelligence than, say, a potato. But the situation was getting out of hand. We had no antivenom with us. If either of us was bitten, it was a three-day journey to the nearest hospital at Ende. “I’d say we’re getting to that point,” I conceded. “Watch! Watch!” April shouted. Even backing away, the snakes were gaining on us. I reached for a stout piece of timber from the fire and dispatched the lead snake, crushing its head in a cloud of sparks. “Very sorry, Mister Snake.” Again, I swung the timber. The snake convulsed into a pretzel, then was still. The others were nowhere to be seen. Treading carefully, I picked up the two carcasses and threw them under a tree above the high tide mark. If one of us was indeed bitten during the night, at least one of the snakes would accompany us to Ende to be identified for the right antivenom—assuming the victim survived that long, of course. We then slipped the covers over the cockpits, and retreated to the safety of the tent. In the morning, April described the dreams she’d had during the night. Snakes dominated all of them: “Hanging off my legs, gnawing at my flesh.” It was the Lariam talking, the same lucid dreaming as on the Coral Sea voyage. Gingerly, we crawled out of the tent, taking care not to disturb any visitors that might have crept under the groundsheet for warmth in the night. I started a fire for tea, while April took a walk down the beach. A minute later, she was back, her face drained of colour. For the first time I noticed a dead tree partially submerged in the shallows, its grey skeletal limbs poking out of the water like the ribcage of an elephant. I felt the hairs on the back of my neck stand up. April, too, looked rattled. “Maybe they got washed out to sea?” she said. This entry was posted in To the Brink excerpts and tagged adventure, banded sea krait, black magic, kayaking, sea snake by Jason Lewis. Bookmark the permalink.